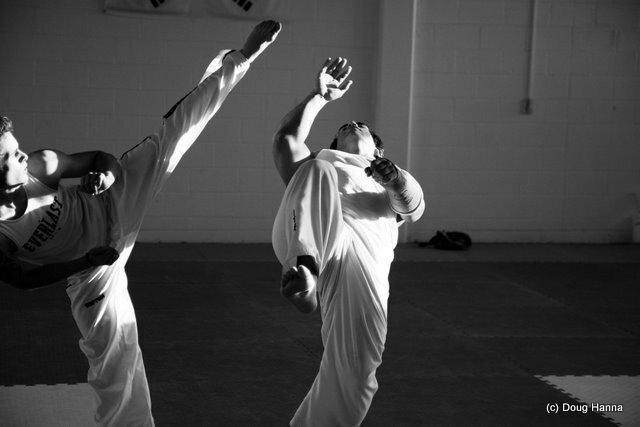 I've recently been combing through all my "keeper" Taekwon-Do images and discovered a few nice shots that I've previously overlooked. Quite a few were taken on the same Sunday afternoon back in May 2007 prior to departing for the World Champs. The sun was low and streamed through the western windows of the Impact Club Dojang creating nice natural high contrast lighting. I don't know how I missed this image - I love it! It looks like Luke is about to end up on his back on the floor. The harsh sunlight has caught them both really nicely.